National Test House (NTH) Recruitment 2017 | 53 Post MTS, Electric Welder | 10th Pass, ITI Pass: National Test House, Ministry of Consumer Affairs, Food & Public Distribution, Department of Consumer Affairs, Krishi Bhawan, New Delhi-110001 has published recruitment notifications for below mentioned various post. Age Limit: please read below mention officially notifications carefully. 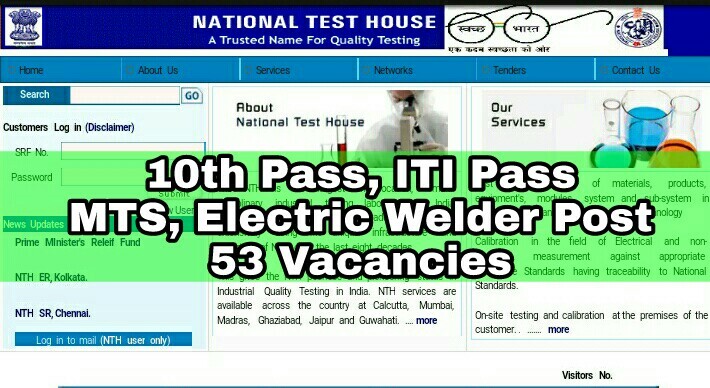 (1) Essential : 10th (Matric) class pass with science or equivalent and ITI Trade Certificate in the welding trade from a recognized Institute or Organization. (5) The Scientist In-charge, National Test House (NER), Kalapahar, CITI Complex, Guwahati-781016.